In a paper published online at Nature Physics, ALPHA announces confinement of antihydrogen atoms for at least 1000s. L ast November, we announced in Nature that we had successfuly trapped 38 antihydrogen atoms for at least 172 ms. In fact, 172 ms is the shortest time we can trap atoms and be sure that we've removed all of the other particles that can be around. By simply leaving the magnetic atom trap on, we can easily make measurements for longer times. Our complete data set from last year is made up of 309 annihilation events consistent with antihydrogen annihilation, 19 of which occur after holding the trap for at least 1000s. 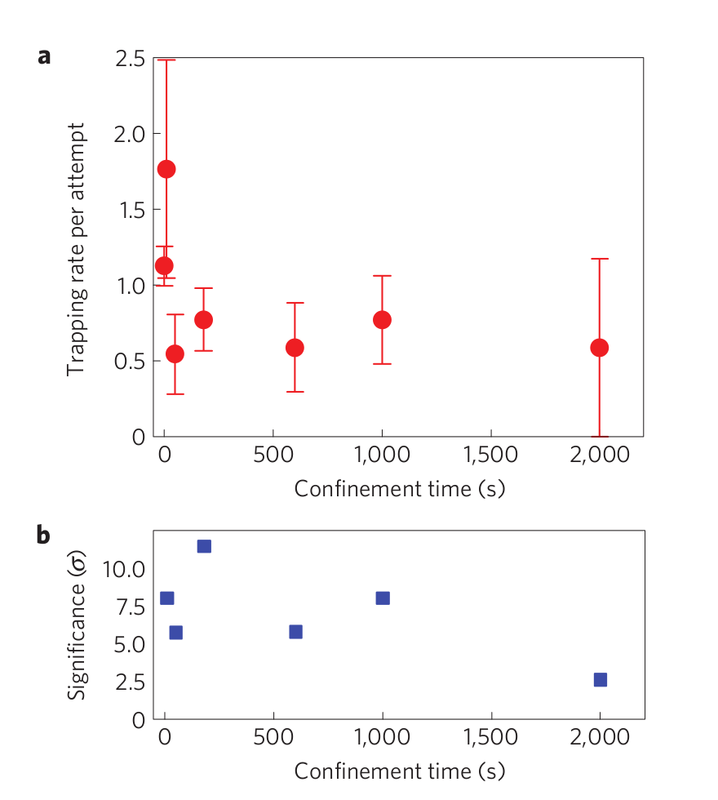 In the figure here, we show the number of atoms trapped as a function of the confinement time. These results strongly imply that the antihydrogen atoms have reached their lowest-energy (ground) state while in the trap, which is important for the ground-state spectroscopy that ALPHA plans to perform on the trapped atoms. In addition, the large number of atoms allow us to compare the time and position at which the atoms escape the trap to simulations and shed light on the energy distribution of the trapped atoms. Read more about the results here or read the full paper. See the news sites reporting on this story.